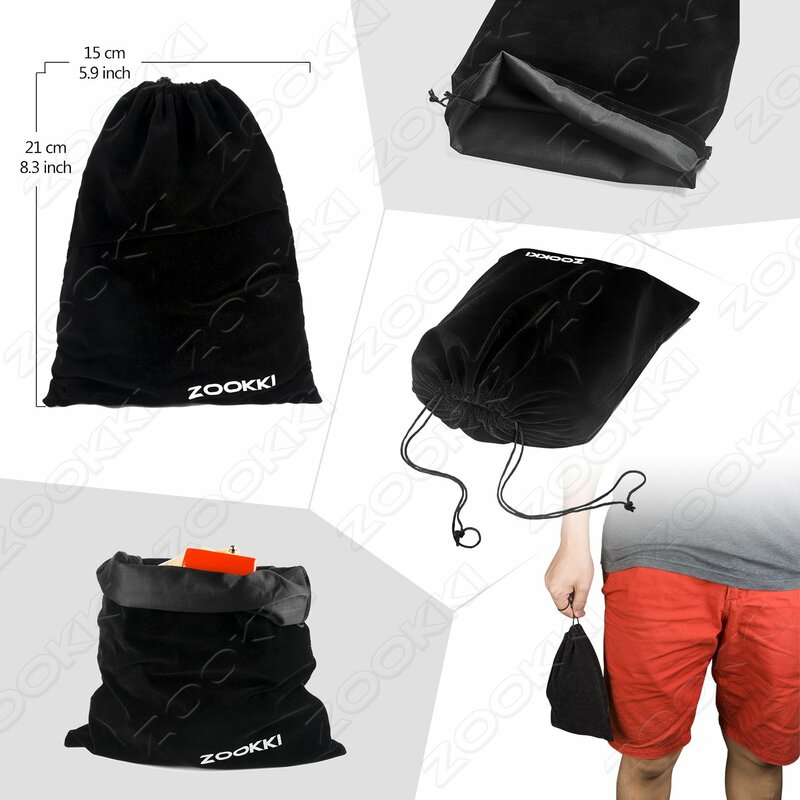 Accessories displayed in the first picture are all included in package. Chest Belt Strap Mount + J-Hook Buckle. 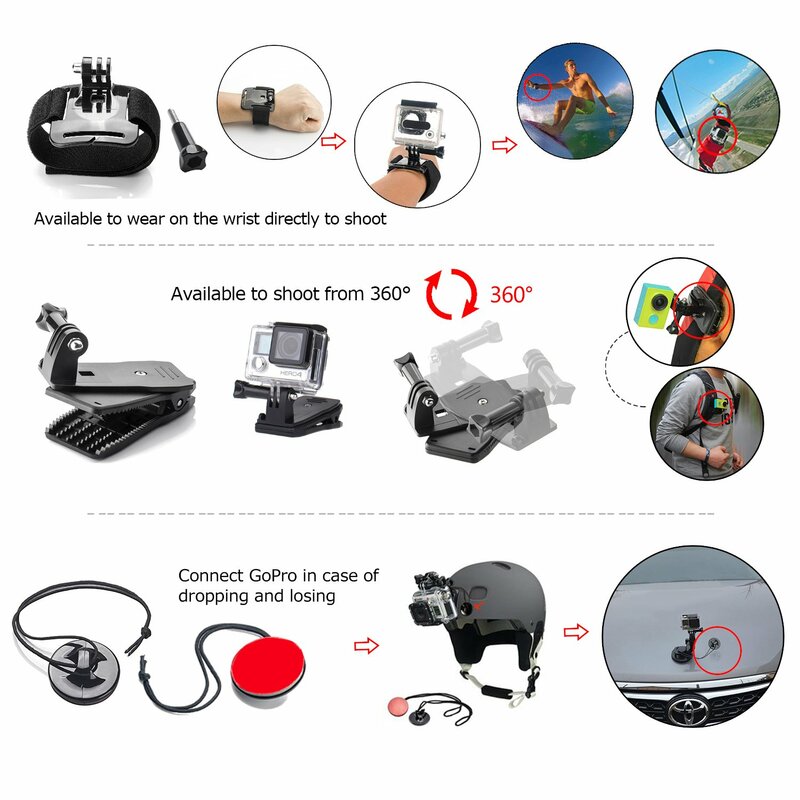 It allows you to install the gopro camera on your chest. The length of the strap can be adjusted to the best to make you comfortable. No need to worry about the firming problem. When the camera is fixed well, you are free to do anything. Any awesome pictures won't be missed. 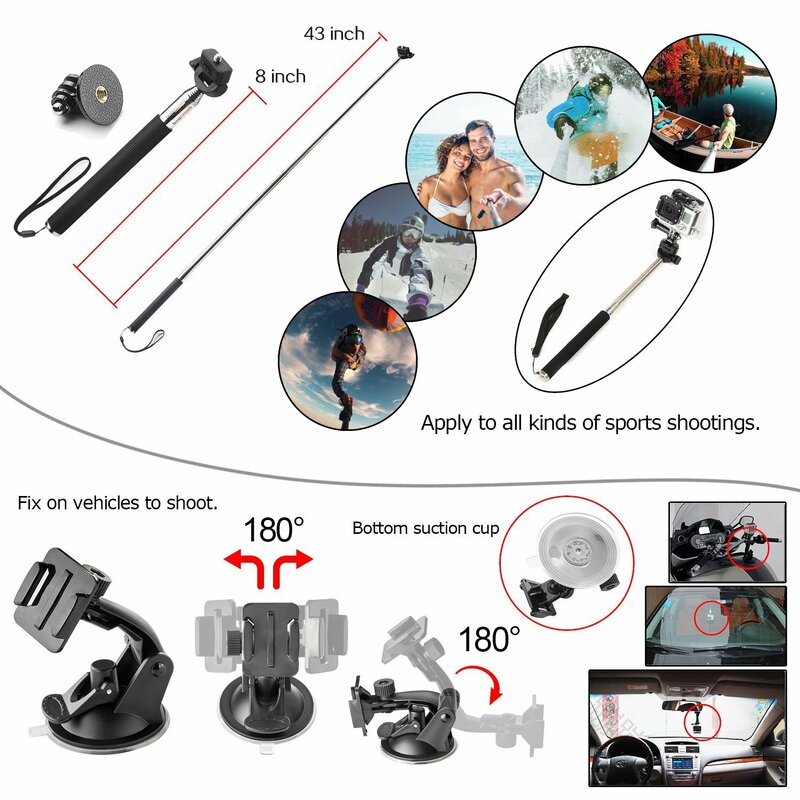 Car Suction Cup Mount Holder + Tripod Mount Adapter. The car suction cup mount holder is an universal gadget. You can adjust the GoPro to different angles by rotating the adapter's position. 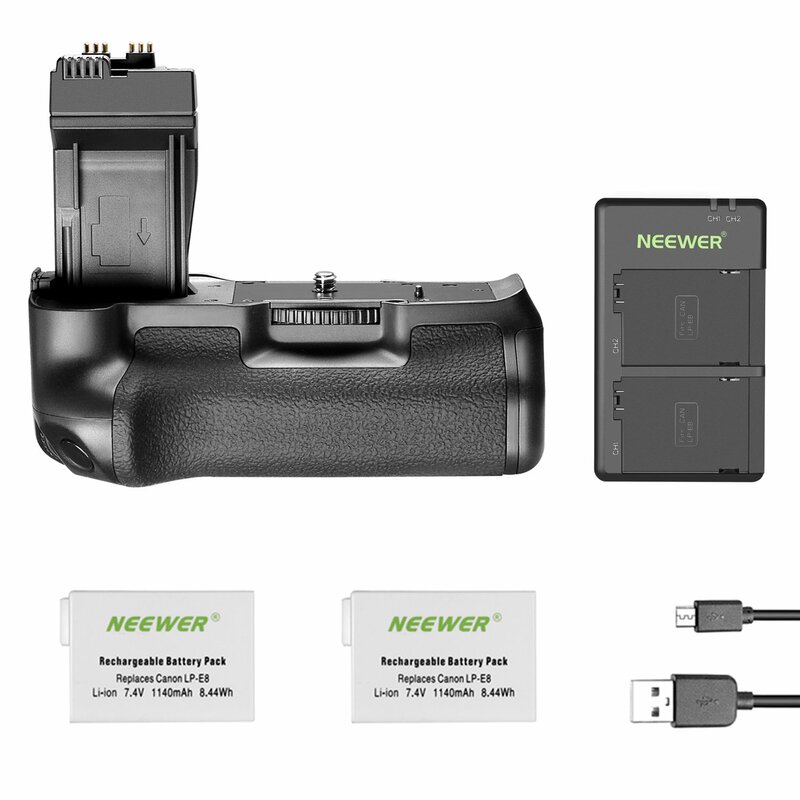 It can records the scene inside or outside the car easily when you are driving a car. 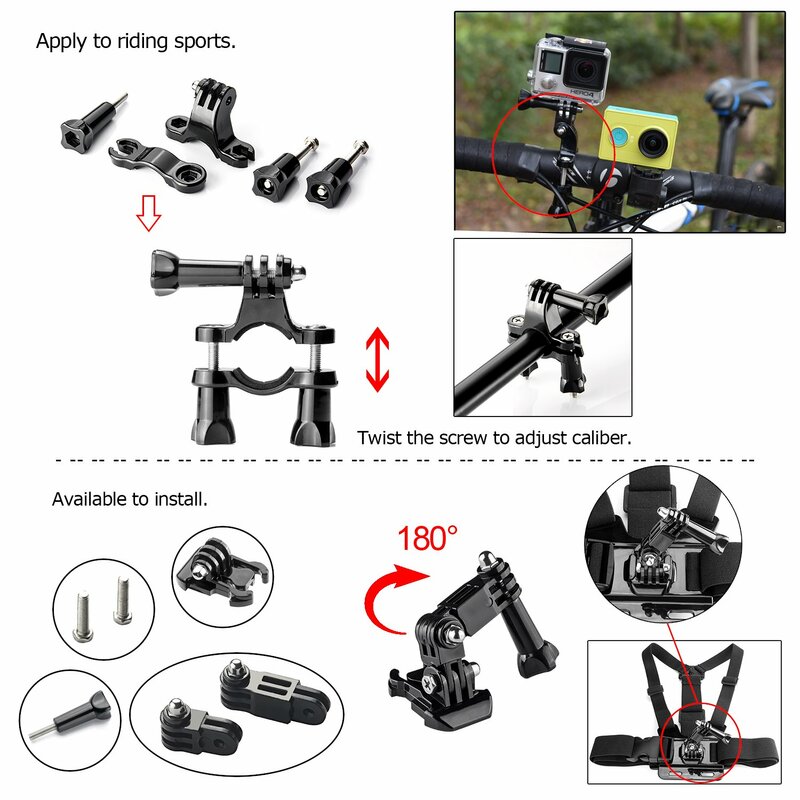 Bike Handlebar Holder Mount + Three-way Adjustable Pivot Arm(Without Surface Quick Release Buckle).By turning the screw, you can achieve the effect of adjusting the size of the interface. No matter what size of your bike or motorcycle's handlebar is, it can be easily and securely installed on your bike or motorcycle handlebar. 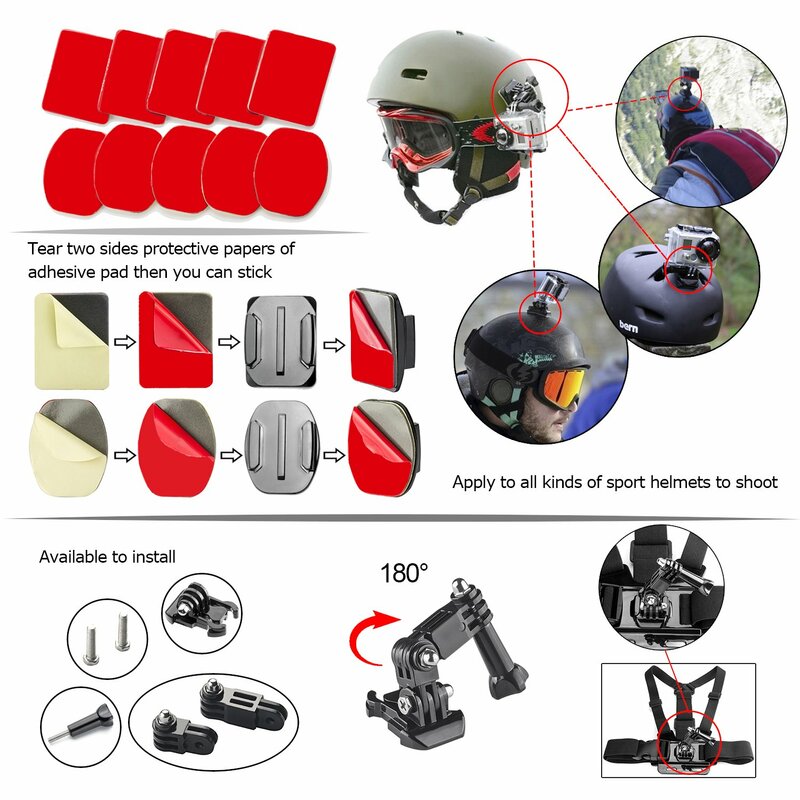 This kit is a bargain for those looking for a bunch of accessories for their action cam. There is nearly everything in the package but I would not trust them for heavy duties. First, they are made of cheap plastic, not very solid, they might break under heavy solicitation. 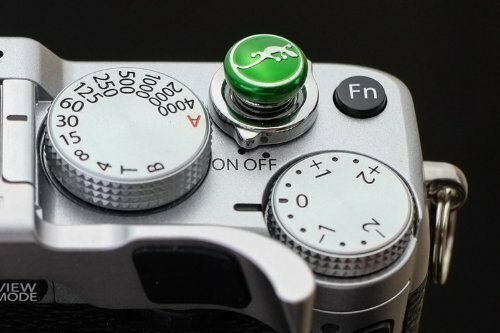 Second, there is one accessory which would have been a great addition: the tripod conversion adapter, the one with a tripod screw and a go pro attachment. So I tried the selfy stick with my YI 4K+ which is pretty lightweight and the stick was bowing when fully extended and a bit wobly on first segment (the biggest one), you could see the massive play in the junction. It was even worse with the camera inside its waterproof case! 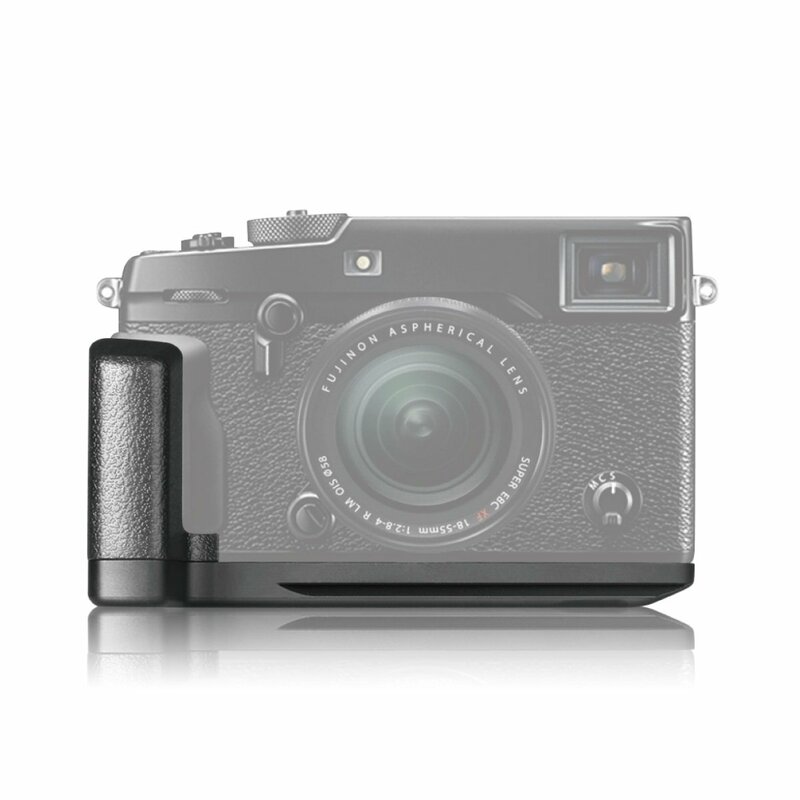 The part which attach to the camera is quite weak and very difficult to tighten due to the tiny knob. I would never trust it on the long haul. The other item I tried was the bike attachment and I found it pretty weak: when tightening it so the support would not move too much, the plastic can be seen elongating next to the screws. The rubber band inside which is supposed to prevent slips is really thin and does not prevent the support to move even fully tightened (to the extend where you think it is nearly going to break...). I did not bother trying the other accessories as I already have most of them. The suction cup seems to have good suction grip but the joins do have some play and the head where you attach the camera do not hold firmly in place even when completely tightened. 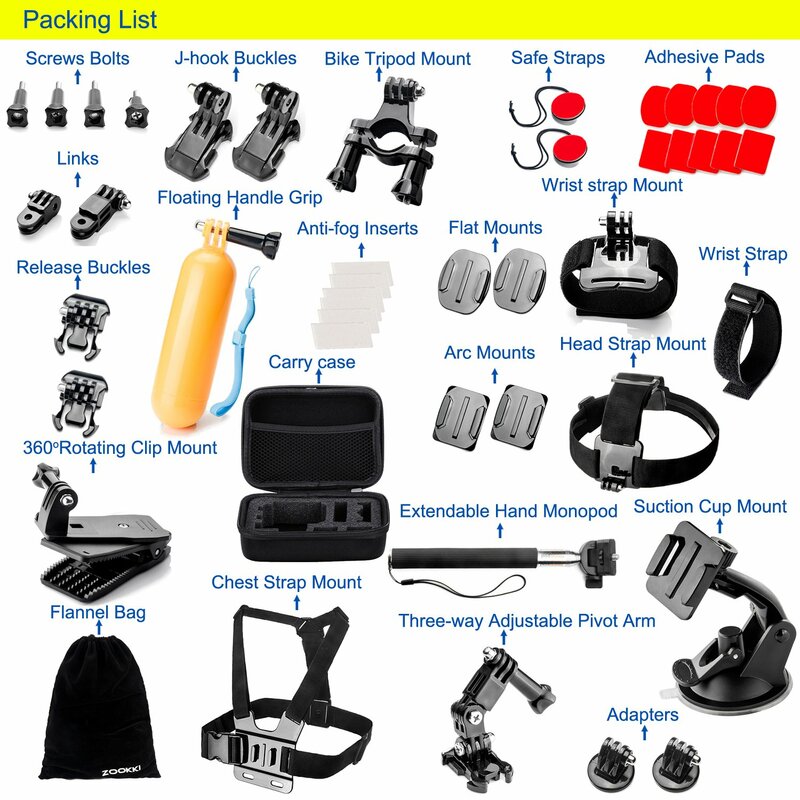 All in all, this is more of a discovery kit to try out what kind of accessories you would need for intense activities but it is not meant to last. This is a great starter set if your don't know what you will use the quality is not great but it is good enough to see what you will use. If you find your going to use something on a regu,are basis then you can spend a little more and get a more quality item. I wanted to check out the float and head strap. I will probably buy another better made head strap because I will use it more in the future but will probably only use the float once or twice in the next 10 yrs. Many of the mounts I will probably never use but someone younger might find they will use and want more mounts. This ZOOKKI met all of my expectations and more. 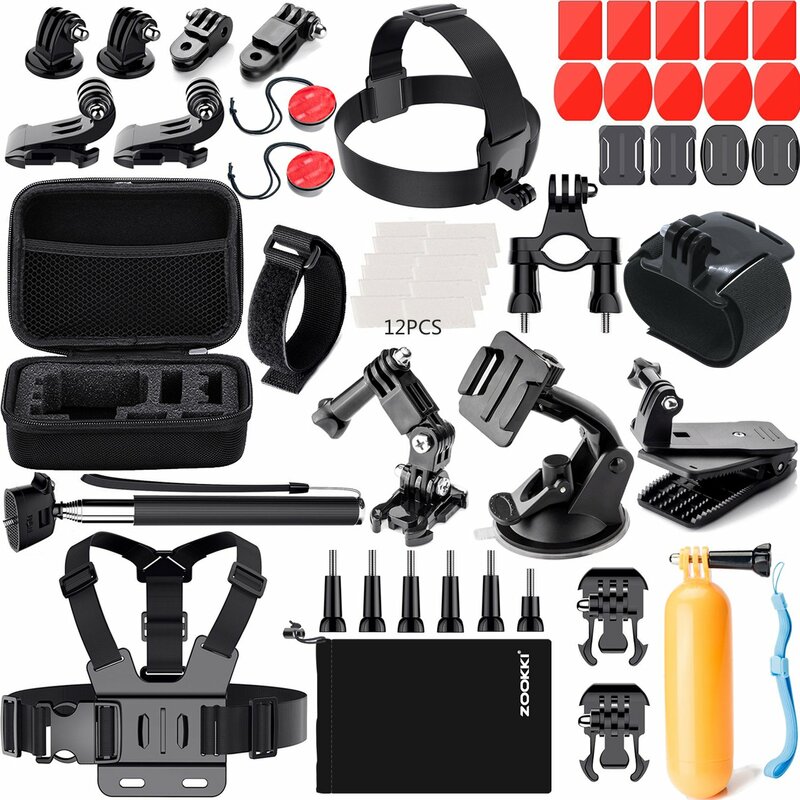 Like if MacGuyver had a GoPro Kit, this would be it b/c it has everything you can think of head, chest, lots of stickons, clip, screwmount, car mount..............you name it. I would have to say that the bike one saved me big time b/c I had another bike clip but the mountain bike frame was super thick so it wouldn't mount at all, but fortunately this one barely fit but it fit and I was able to grab some footage. Also would like to add that I don't have a GoPro but a different action camera and it fits perfectly, just saying it doesn't have to be a GoPro as stated, just have to have to same size for the finger thread bolts or whatever the term is. I ALMOST gave a four star ratings because I didn't see any instruction manual but I went back to the Amazon web page and seen the tutorials are on the bottom. ( and video format) all the items look pretty durable for the cheap cost I haven't tried out any over a long period of time but for $18 I can't complain. 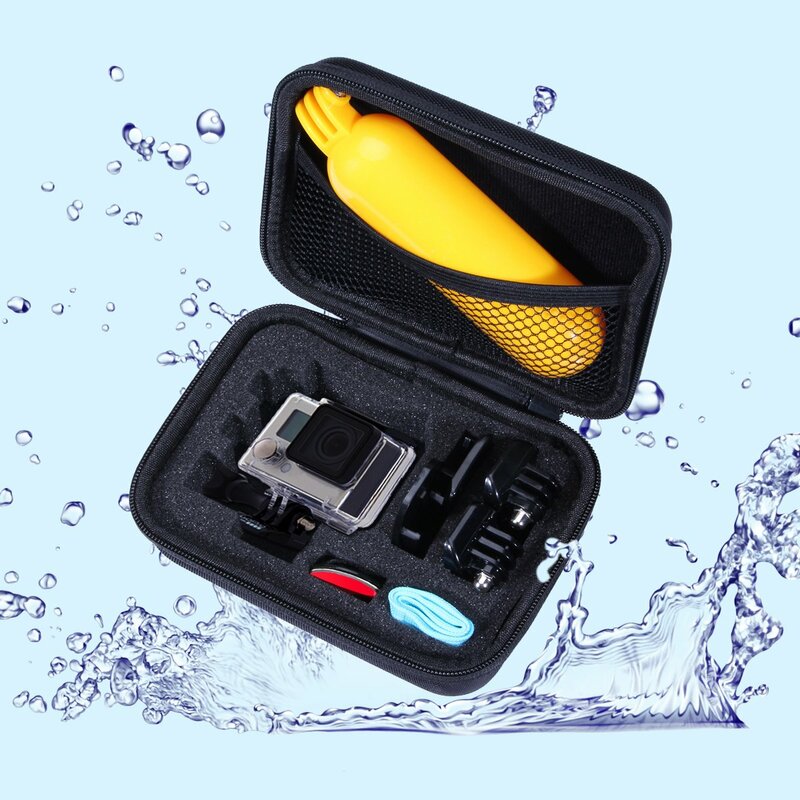 Comes with pretty much every accessory except the waterproof camera case. I get 5 stars because you get A LOT of accessories for such a low price. The seller offered a partial refund due to too many items that were not necessarily useful. It was a good gesture on his part as I did not demand for the refund. Overall, all the items that were useful to me I considered it the value I was prepared to pay for. Great and honest seller. A seller that is trying to offer his best service in products and delivery. It comes with so many pieces an no directions! But once you look back online it all makes sense! 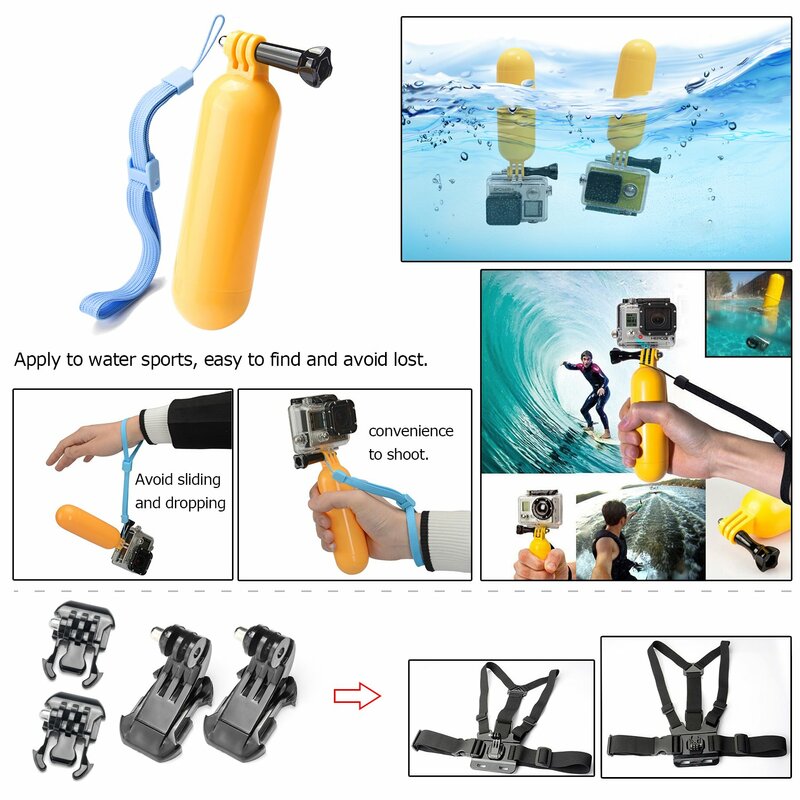 Love this as a cheap alternative to actual go pro equipment. I am using it for my Activeon Gold camera. The only complaint I have is the harness it a bit small! Does fit, but really tight! For reference I am usually a size XXL in clothes and am 5'4'' and 230 pounds. There is no way to go wrong purchasing this item. 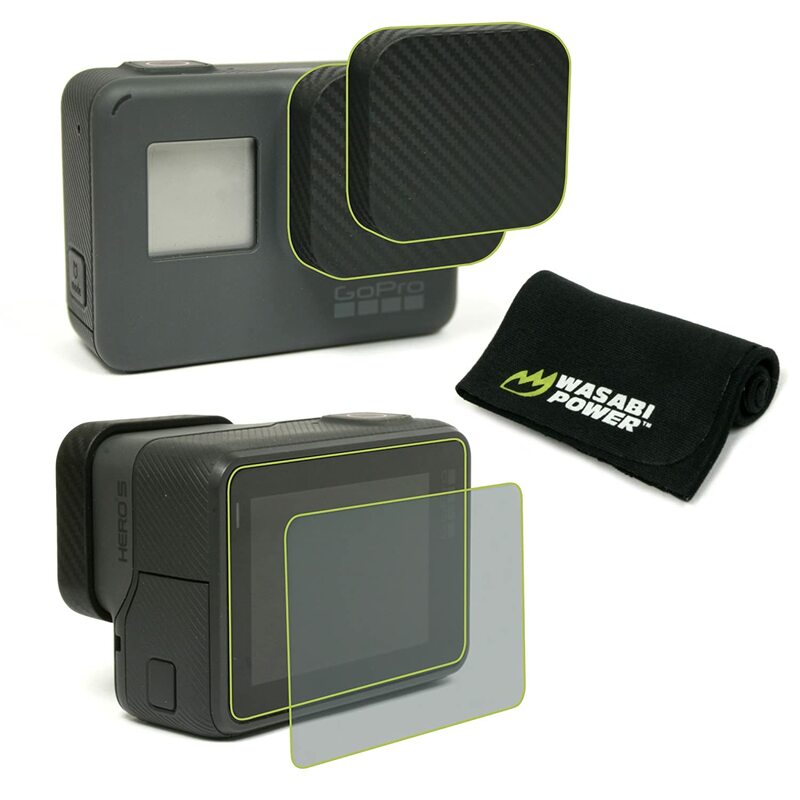 The shear volume of items that you get compensates for the fact that they are not Go Pro OEM. Nonetheless, the quality is sound. The small case is great. I couldn't be happier. I just can't get over how great a deal this is.